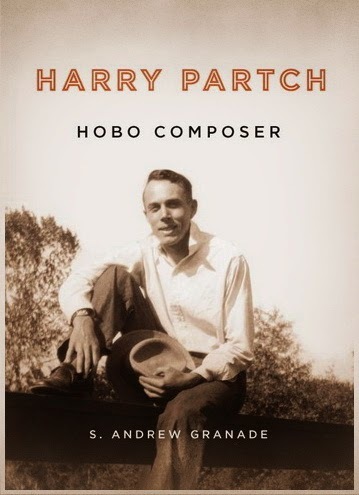 Un nuovo interessante libro su Harry Partch - Hobo Composer, scritto dal musicologo S. Andrew Granade (University of Rochester Press, 2014) - mette al centro della sua vicenda biografica e artistica la cultura hobo che il compositore statunitense abbracciò, almeno in parte, negli avventurosi anni giovanili: "During the Great Depression, Partch rode the railways, following the fruit harvest across the country. Although he is renowned for his immense stage works and his use of highly sophisticated instruments of his own creation, Partch is still regularly called a "hobo composer". Yet few have questioned this label's impact on his musical output, compositional life, and reception. Focusing on Partch the person alongside the cultural icon he represented, this study examines Partch from historical, cultural, political, and musical perspectives. It outlines the cultural history of the hobo from the mid-1800s through the 1960s, as well as those figures associated with the hobo's image. It explores how Partch's music, which chronicled a disappearing subculture, was received, and how the composer ultimately engaged and frustrated popular conceptions of the hobo." Uno dei capolavori di Partch, Delusion of the Fury, è stato di recente prodotto e portato in scena dall'Ensemble musikFabrik con la regia di Heiner Goebbels.